Bolton midfielder Gavin McCann has retired from football at the age of 33 after a 16-month absence with an ankle injury. McCann, formerly of Everton, Sunderland and Aston Villa, will now take up a coaching role assisting the youth set up at the Bolton academy. McCann said: "Unfortunately I've had to call it a day. "There are times now when my ankle is sore and aches, and further down the line I will need another operation." McCann made a total of 363 appearances at club level and won one one cap for England in a friendly against Spain at Villa Park in 2001. 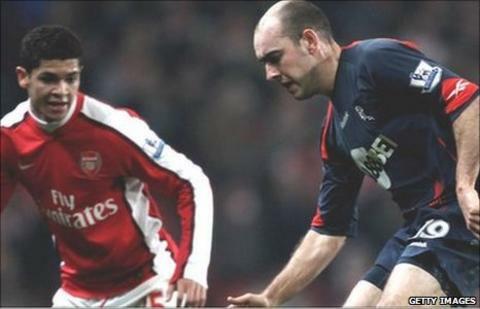 He last featured for Bolton in the 4-2 defeat by Arsenal at the Emirates on 20 January 2010, and underwent surgery on his injured ankle soon after. But despite attempting to make a return in pre-season at the beginning of the campaign, after speaking to the surgeon he made the decision to hang up his boots. McCann continued: "I have to give thanks to the staff at Bolton, particularly the club doctor and the gaffer. "They were accommodating and let me still train and use the facilities at the club as I tried to get back to full fitness, even though my contract had expired."